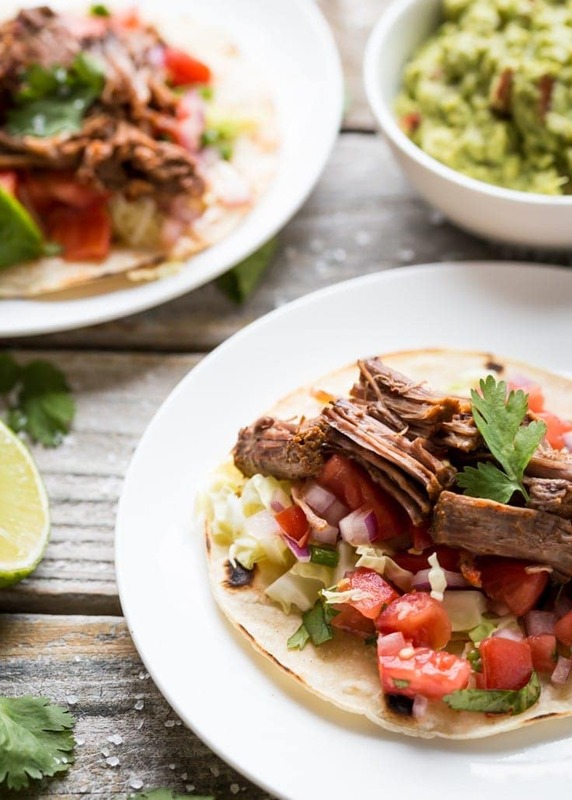 Pot Roast Tacos are very easy to make and make a great weeknight meal option that you can cook in the oven or in a slow cooker if you prefer. I’ve got a few quick tips below to ensure you get the most from this easy recipe! When you season the beef chuck roast with the salt, pepper, cumin, chili, garlic and cayenne pepper make sure that you mix the spices together first and then rub them well into the meat. Brown the meat on both sides, don’t skip this step! When you brown the meat well it adds to to the overall flavor and is really worth it. If you are cooking your pot roast tacos in a slow cooker please take care not to overcook the meat. Your cook time will depend on how large your piece of beef chuck is and how hot your slow cooker gets, the newer ones tend to run hotter than the older models which cooked at a lower temperature. 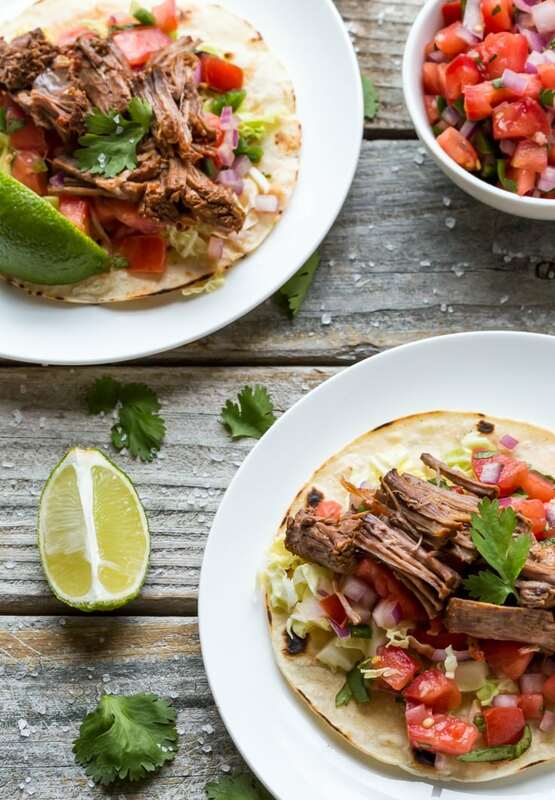 Corn tortillas are a must for Pot Roast Tacos. I like them best if they are warmed and slightly toasted in a cast iron skillet first as it improves the flavor tremendously. 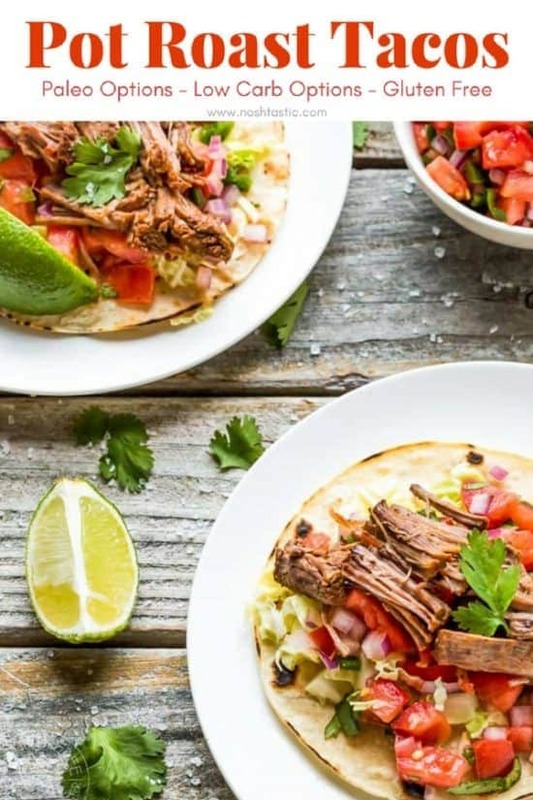 If you are following the Paleo or Whole30 diet then you’ll want to skip the corn tortillas that these pot roast tacos are normally served with and either wrap them in a large piece of lettuce or simply eat it from a bowl with the sides. Guacamole is a must, if you can make it homemade that’s the best, if you don’t have time then avocado slices will work instead. I love red onion slices with my pot roast tacos, they have a different flavor to white onions and I think they work really well with this dish. I also put out some salsa, shredded lettuce and lime wedges to serve, add a little squeeze of lime to the meat just before you eat it really adds to the flavors already there. My kids love to add shredded cheese and sour cream, that may not be strictly authentic but they enjoy it and they pile it on top of all the other sides! 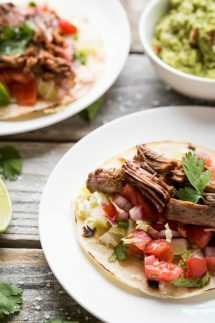 An easy Pot Roast Tacos Recipe made with a beef chuck roast that tastes delicious and can be made in the oven or in a slow cooker. Season the meat with salt and pepper on all sides, and then rub the spices into the meat by hand, then add the meat to the pan and brown well on both sides. Heat the oil in a Dutch oven and brown the meat well on both sides then remove the meat and set aside. Add the tomatoes and onions to the Dutch Oven and a 1/4 cup of water and simmer for a few minutes and make sure to scrape up the meat juices from the bottom of the dutch oven. heat the pan and contents on the stove top until the tomato mixture is hot, add the meat on top of the tomatoes put the lid on the pan and put it in the oven. Cook it at 325F for 30 minutes, then at 300F for two hours or until just tender. Season the meat with salt and pepper on all sides, and then rub the spices into the meat by hand. then add the meat to the pan and brown well on both sides. Add a little oil to a hot skillet then add the meat to the pan and brown well on both sides. Add the tomatoes to the pan you browned the meat in and simmer it for a minute or two and scrape all the meaty bits from the bottom of the pan, then add that to the slow cooker. Add the tomatoes from the pan along with the onions to the slow cooker and place the chuck roast on top. Cook the chuck roast on HIGH for 3-5 hours or 5-8hrs low. Some slow cookers run hotter than others so it's hard to give an exact time, I would check the meat after the shortest listed cook time, if you overcook the meat it will become dry and stringy and lose flavor. These look so tender and flavorful! Yum! Thanks MaryAnne! I wish it would hurry up and cool down, and rain! I don’t think the drought here is as bad as you have it in California, but it’s pretty bad. I can’t wait for taco Tuesday but pot roast tacos is the best of Mexican and comfort food! Pot roast tacos, love it! These really look and sound terrific! Over here, it’s in the 30s. Why can’t we all just have regular fall weather?! 😉 And these tacos look delicious! Love the combination of spices. I made this roast the other night…so GOOD!!! My roommate said he was weak in the knees it was so good. I made a couple adaptations; I used New Mexico chile powder, instead of Ancho, and after browning the meat, I deglazed the pan with about 1/2 cup beer (there are GF beers, right?! ), before adding the tomatoes. It was incredible! I also squeezed some lime on the tacos as I ate them…amazing. The meat is also fab in quesadillas (corn tortillas, of course). So great for so many great meals, thank you! Hi Jennifer, so glad you liked this, it’s such great flavors and what a genius idea to use the beer to deglaze the pan I love it! Yes there are gluten free beers, but I’m not a massive beer fan so I haven’t checked them out, I probably should though!